September 27, 2008 was the official closing date for the clubs of Pleasure Island. While there were several private parties that brought the clubs, specifically the Adventurers Club, throughout the next year, the general public has been without the clubs for almost three years now, with only rumors and dance parties to fill the space. In fact, the future of this space is so questionable, that even the Hyperion Wharf designs have been rumored to be cancelled, artifacts from the Adventurers Club have been found elsewhere, and even the world famous Colonel is supposedly up for sale. One can only hope that whatever becomes of this district, that it will be filled with the same sense of life and story that Pleasure Island was constructed with. Pleasure Island opened on the same day that Walt Disney World welcomed Disney-MGM Studios, now Disney’s Hollywood Studios, to the theme park family, May 1, 1989. Venturing back to the beginning, here is one of the first glimpses released of Pleasure Island and the Adventurers Club, from July of 1989. 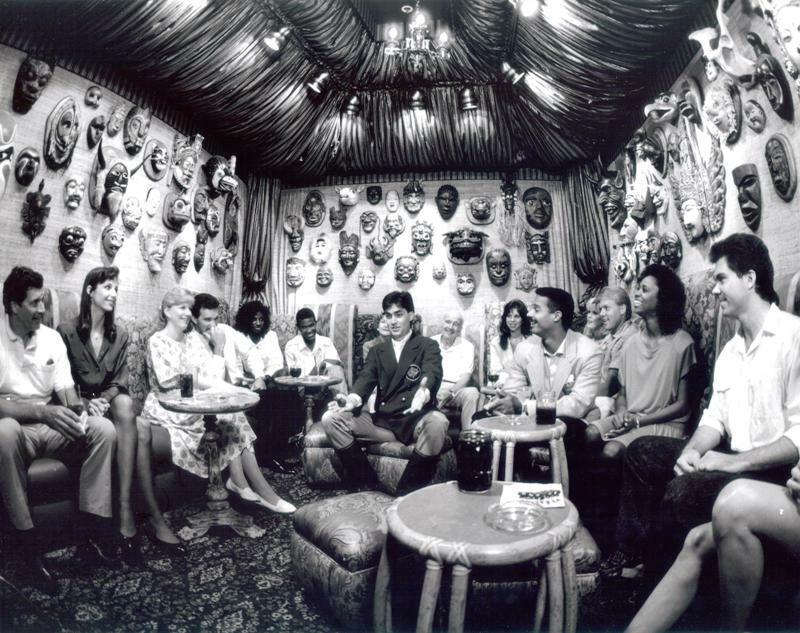 ADVENTURE STORIES ABOUND in the Adventurers Club on Pleasure Island. Here, club guests gather around Handsome Hathaway Brown as he spins yarns about world travels in the club’s “mask room,” where a hanging head or two occasionally may react to the conversation. Pleasure Island is located at Walt Disney World Village. I miss the AC so much... can't help hoping it will be reincarnated on some Disney property one day! Kathy, I'm with you! I love that a few pieces have scattered out and about aound property, and I hope some of them make their way to Hong Kong so I can see them when I get there. As for WDW Adventurers Club, I hope the style stays the same if/when they reopen it, but I'd love to see WDI's take on a different era of adventurers!